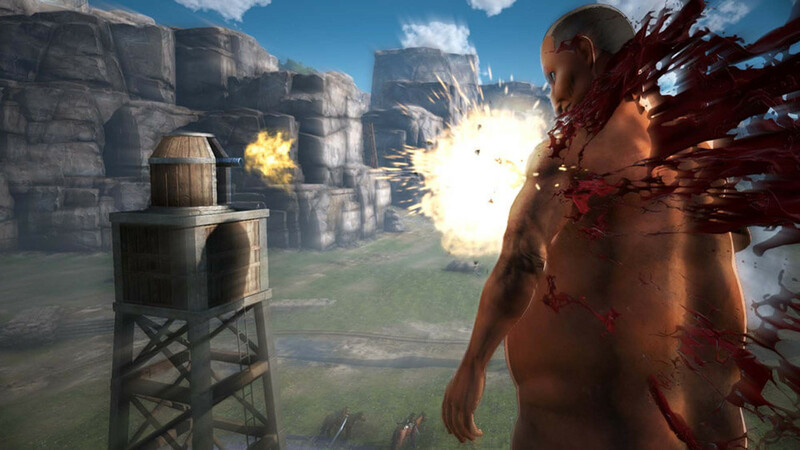 Syed swings into action against some huge naked men in Attack on Titan 2. 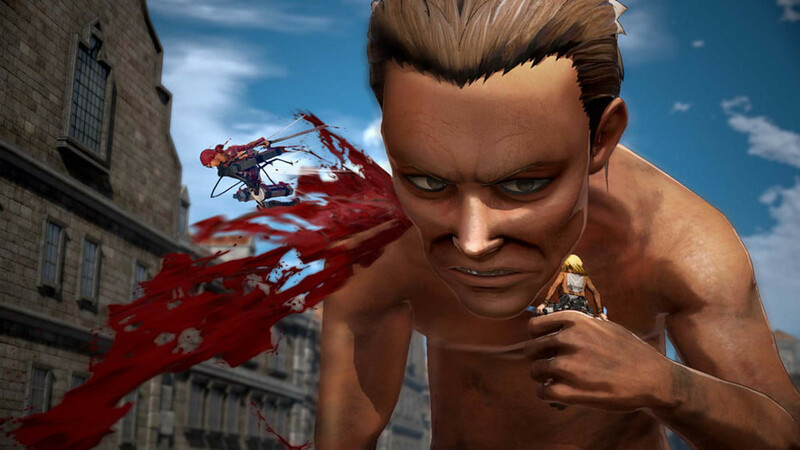 Based on the hit anime series Attack on Titan, 2016’s action hack-and-slasher A.O.T: Wings of Freedom was praised for its fast-paced gameplay and faithfulness to the source material. However, it was heavily criticised for the repetitive nature of its missions. With the release of season two of the anime in 2017, developer Omega Force has followed suit with A.O.T 2. The story follows that of the anime, but for some reason does not pick up where the first game left off. Instead, it starts back at the beginning of season one again, and is told via the journal of a fallen member of the Survey Corps. Who is this nameless soldier, you ask? Why, it’s you! Instead of playing as characters from the show, you play through story mode as your own custom soldier. The character creator is surprisingly in-depth, akin to that of fantasy RPGs such as The Elder Scrolls and Dragon Age, letting you customise details right down to the size of your irises, resulting in some hilarious and… horrifying results. Though, to the game’s credit, it does allow you to make a trans character if you are so inclined. However, due to your character sticking their nose into and influencing every major event from the anime, it all feels very much like a fanfiction – especially with cast characters constantly telling you how amazing you are. Fortunately, your role does not interfere with the intense, chilling moments from the anime that, like in Wings of Freedom, have been lovingly recreated here. Gameplay-wise, A.O.T 2 takes the first installment and expands on it. As before, your abilities are centred around the iconic Omni-Directional Movement gear from the anime, which acts as your primary mode of transportation. This is just as fast, flowing and free as in Wings of Freedom, and is reminiscent of the web-slinging in Activision's 2004’s film tie-in Spiderman 2. Omega Force has even added the ability to wall run. The ODM gear is also your main means of combat, as you use it to latch onto the titular titans and slice into them with your blades. Although the game is labelled a hack-and-slasher, that is by far the worst way to go about taking down titans. Rather, finding the right speed, angle of attack, and attack timing is crucial for maximising damage output, making strategy key in combat. This, along with weapon degradation and equipment management, emulated the show’s concept to a T in the first game. A.O.T 2 takes it a step further with Buddy Actions. Each of your comrades has their own ability such as a combo attack, healing item, or flash grenade that you can order them to execute to aid you in battle. These go on cooldown after each use, adding another layer of strategy, and ignoring them will result in you being overwhelmed by titans. Not only does this incentivise teamwork – again, just like the anime – but it also gives your allies more of an active role rather than a passive one like in Wings of Freedom. A number of other new mechanics have also been added to alleviate the repetitive nature of combat. These include stealth attacks, the ability to build bases with a number of different functions, and the option to capture titans instead of killing them in return for unique rewards. The titans themselves have also been upgraded so that even a single one, no matter its size, can pose a considerable threat. They now have a detection gauge that once filled, initiates Danger Zone. While in this mode, a Titan will focus solely on the player, will attack faster and more aggressively, and will prevent you from dropping your lock-on to escape. This encourages you to eliminate each titan as quickly as possible, once again (not to sound like a broken record) just like in the anime. These are very welcome improvements that reinvigorate the first game’s formulaic combat. Unfortunately though, the fact remains that all of the mission objectives are still just “kill the titans” – the number one criticism of the first game. After completing a mission, you return to your Daily Life, which is essentially the game's overworld. Here, you can interact with other characters, craft and upgrade new equipment, and pick up scout missions – side missions that provide more experience and rarer crafting materials than story missions. The name "Daily Life" is an apt one, as it all feels much more alive than the overworld in Wings of Freedom, which was a very static, bare bones pit stop between missions. Here, characters can be seen actually walking around and interacting in the hustle and bustle of life within the walls, and they even greet you in the street as you walk past them. You are also no longer confined to just one area. Here, you can also establish friendships with cast characters by taking them on missions with you, or by engaging in conversations with them. Reaching a certain friendship rank will unlock equippable skills for your character, ranging from things like stat boosts and reduced weapon degradation to special attacks. Visually, the game looks gorgeous. The cel-shaded art style blurs the line between anime and video game, and the lighting effects are just beautiful. A number of the HUD elements from the first game have been removed, and the ones that remain have been pushed to the edges of the screen, making everything much less cluttered. But with this step forward comes a step back. The mini-map icons are tiny, even in the zoomed in view, and the icons for titans are now a dull grey colour instead of red. This makes them blend into the background, even in green areas like the forest, which makes it difficult to determine which ones you need to kill in order to progress. There are also some graphical glitches, such as your character’s neck clipping through their hair. The particle effects from a titan’s evaporating corpse and the destructible environments can also occasionally cause the framerate to tank, but this fortunately only lasts a second or two. A.O.T 2’s sound design is just as good as its visuals. The wet, visceral sounds of your blades slicing into titan flesh accompanied by the spray of blood really emphasise the impact of your blows. The voice acting is on par with the anime, as most if not all of the original Japanese cast reprise their roles, bringing their A-game. And the choral and orchestral soundtrack is just as epic as that of the anime. Aside from Story Mode, there is also Another Mode (10/10 naming). Like Expedition Mode in Wings of Freedom, Another Mode lets you play the scout missions as one of the characters from the cast either offline on your own or online with other players. This time around, there are a few additional modes of play. There is SOS, in which you can aid players having trouble with a particular story mission; and Annihilation Mode, in which two teams of up to four players each try to kill as many titans as possible within the time limit. The scout missions and SOS both tie in with the anime’s theme of teamwork. But Annihilation mode feels as though it was just tacked on for the sake of there being a PvP mode – especially since many of the new mechanics, such as the different buildable bases or capturing titans, are either removed or made redundant. This makes Annihilation play a lot more like the first game. Then there’s Joint Development. Here, a player can submit any equipment they have to be upgraded, and another player who has the materials needed for that upgrade can build it for them. Once they do so, both players will receive a set of said equipment. This is a great idea that once again correlates with the anime’s focus on teamwork. Unfortunately, it stumbles in its execution. You can only submit one item at a time, and after doing so, you cannot play any of the other modes while you wait for someone to take it. You cannot even craft items the normal way, as doing so will cancel your current Joint Development session, so you just have to wait in the online lobby for Wall knows how long. A.O.T 2 boasts some definite improvements over the first game, and is as faithful if not more so to its source material. While it can certainly be considered the definitive Attack on Titan game at present, some peculiar design choices and the repetitive nature of the missions hinder it from achieving its full potential. 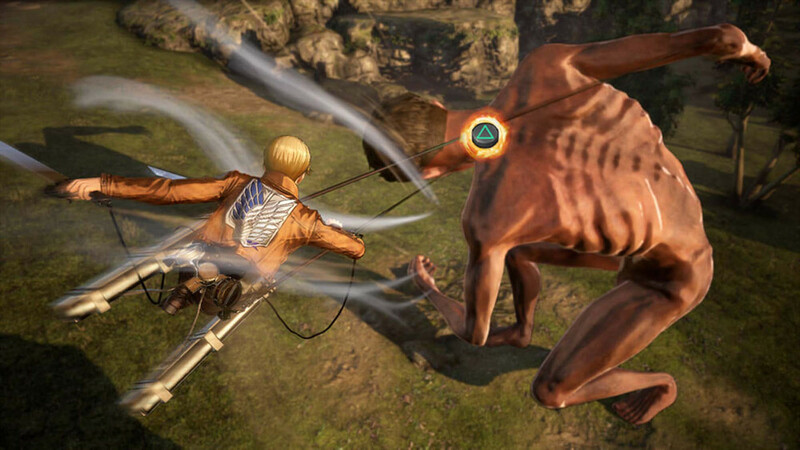 While it's certainly the definitive Attack on Titan game, A.O.T 2’s repetitive missions and lackluster online mode will quickly turn stale the freshness of the updated gameplay. Ups Very faithful to the source material. In-depth character creation system. New and improved gameplay mechanics perfectly emulate the show and spice up combat. Overworld feels more alive. Gorgeous visuals and sound design. A-grade voice acting. Downs Plot feels very fanfiction-y with player’s self-insert. Repetitive mission objectives unchanged from first game. Minimap icons are small and blend in with the background. Minor graphical glitches and frame drops.